Research to date has focused on fitness costs that coalitional aggression imposes on men and how these may have shaped male cognitive design. This study investigated whether warfare may have shaped female cognitive design by identifying fitness costs that lethal raiding imposes on women and determining how widespread these fitness costs are across a sample of forager and forager-horticulturalist societies. To this end, archaeological and ethnographic accounts of lethal raiding were used to generate a list of fitness costs suffered by women in warfare. Five costs were identified: woman killed, woman captured, offspring killed, mate killed/captured, and adult male kin killed/captured. A cross-cultural sample of forager and forager-horticulturalist oral traditions was then surveyed for the presence of these costs. 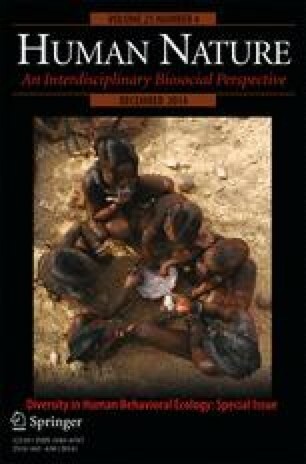 Results suggest that lethal raiding has recurrently imposed fitness costs on women, and that female cognitive design bears reexamination in terms of the motivational and decision-making mechanisms that may have evolved in response to them. This study differs from previous studies of lethal raiding by addressing the lack of comparative research on the fitness costs of warfare for women, by examining a wider range of fitness costs, and by using oral tradition as a database. I thank Lawrence Sugiyama, Klaree Boose, and two anonymous reviewers for their helpful insights and suggestions.